There’s an accepted modern-day footballing rule of thumb that suggests if you want to add skill, craft and guile to your team then go out and sign Spaniards. Just a few short decades ago the situation was the polar opposite. The highest profile Spanish players of the early 1980s were more kicky-hacky than tiki-taki and La Liga’s creativity was mostly contracted out to its big name imports. Barcelona were little different: West German midfielder Bernd Schuster and the Danish winger Allan Simonsen supplied the stellar quality, while their teammates of Spanish provenance – whether the hardened veterans or the fierce youngsters – did the dirty work around them. The evergreen striker Quini was an honorable domestic exception and Barcelona relied heavily on his goals. In March of 1981 he had been kidnapped and by the time he was released unharmed 25 days later, his teammates had collected just a single point from the four games he missed. Another promising title push ended in faintly ludicrous circumstances. Approaching the 1981-82 season and determined to shed this growing reputation for lack of mental strength, Udo Lattek’s appointment as coach made sense on a number of levels. The German was known for his motivational skills and he was expected to bring the best out of both Schuster and Simonsen having previously managed them successfully in the Bundesliga. In a bold move he appointed Schuster as club captain, the extra responsibility Lattek reasoned might help curb those wayward excesses that often undermined the midfielder’s game. A 4-0 hammering in the Nou Camp by Köln in the Final of their own Juan Gamper tournament did not augur well, but once the domestic season got underway competitive form was much more encouraging: Alexanco was in towering form at sweeper, Simonsen was irresistible on the right wing, Quini was putting away goals in his easy, unfussy manner and, pulling the strings at the centre of everything was Schuster. Stupidly sent off at Gijon then involved in a training ground punch up with his teammate Estella, the ever-temperamental midfielder was still never far from controversy, but he was the motor driving the ‘Barcelona Electricos,’ as the press were calling this revitalised team. Such was Schuster’s form that when Bilbao’s notorious Andoni Goicoechea shredded his knee ligaments and ended his season with one of his trademark tackles in December of 1981, there was some panic at the club over the loss of their star man. Frantic attempts to bring in a new foreign star to cover for his absence saw emissaries dispatched to West Germany and Brazil to talk to Bruno Pezzey, Socrates and Toninho Cerezo. The expense involved in concluding any of these deals would have been prohibitive and domestic form wasn’t appearing to suffer unduly – Real Madrid were dispatched 3-1 in Barcelona’s first home game after the Schuster injury. By the March of 1982 a 2-1 home win over Real Zaragoza extended Barcelona’s run of unbeaten games to ten and left them five points clear of reigning champions Real Sociedad with just six games to play. With Barça also having the advantage of a better head-to-head record over the Basque club, finishing level on points wasn’t even going to be good enough for the San Sebastianers. And yet the Catalans didn’t even get close. A longstanding myth suggests that the 1981-82 title bid collapsed at that same moment Schuster had hit the ground clutching his knee, but in reality it was a full three months later before the wheels fell off their campaign. Outplayed at Valencia and meekly surrendering their unbeaten run in a 3-0 defeat could have been dismissed as a blip, but alarm bells started to ring the following week when their city neighbours visited the Nou Camp. Español hadn’t won there since 1973 but cruised into a two-goal lead within 17 minutes and ran out eventual 3-1 winners. The climax of the Round 31 games suggested momentum was now swinging firmly away from Barcelona. With just 5 minutes remaining both Barça and Real Sociedad were drawing their respective away fixtures. The Catalans had fought back manfully to draw level from two goals down in Pamplona only to be stunned by an 88th minute Osasuna winner; meanwhile just 60 seconds later Sociedad grabbed a winner at Valencia. A three point lead in the table was reduced to just one within those few fateful minutes. Morale in Lattek’s team had collapsed, individual errors were rife and there was a distinct lack of on-field leadership to steady the team – a long-standing problem for the club. Arresting the run of four straight defeats in Round 32 brought little satisfaction. The typically angry return fixture at home to Bilbao was drawn 2-2 with Barcelona unable to find a winner despite the visitors playing the last 35 minutes with ten men. 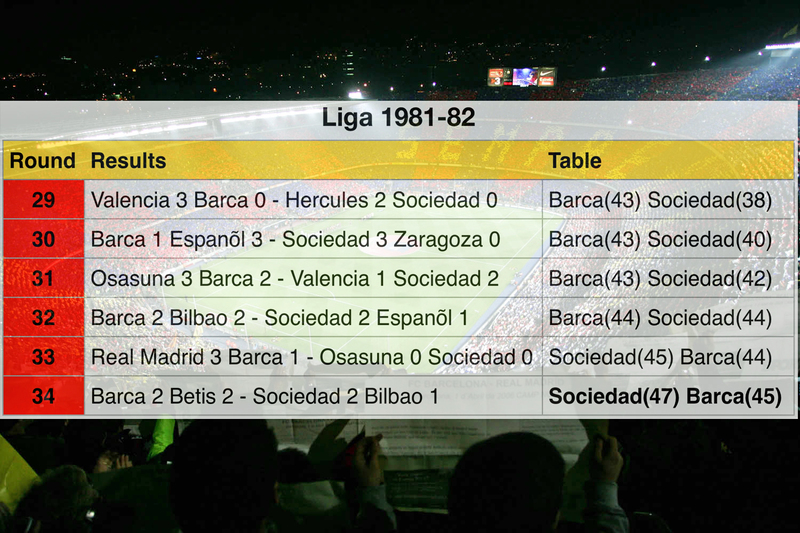 Sociedad won again and with the teams now level on points, only Barcelona’s better head-to-head record keeping them top. A visit in the penultimate round to a Real Madrid side taking huge delight in the growing Catalan calamity was the last fixture Barcelona wanted. Madrid played with an intensity that suggested they were chasing the title rather than their disheveled opponents and fully deserved their 3-1 victory. With Sociedad drawing at Osasuna and moving a point clear in the table, the champions had taken control of their own destiny for the first time all season. The reaction in San Sebastian was incredulous. Coming into the final round of fixtures, Barcelona could still become champions if they defeated Betis at home and Real Sociedad didn’t win at Atocha against their Basque neighbours Athletic Bilbao. As intense as the rivalry between the Basque pair was, to Bilbao the idea of Real Sociedad winning another title was infinitely preferable to it going to Barcelona. Their performance in that final game could charitably be described as lackadaisical and Real Sociedad comfortably won 2-1 – not that Barcelona would have taken advantage of any slip-up anyway. Their wretched season end was typified by the manner in which they threw away a two goal half-time lead to allow Betis to draw 2-2. A team that had needed just seven points from their last six games to become champions, could have still managed it with four and yet managed to collect just two: the 1981-82 season represented the most dramatic squandering of the title in the history of the Spanish League. Winning the Cup-Winners Cup was enough, just, to spare Lattek’s job after this horror show, but he would last just one further season as Barcelona coach. His shell-shocked squad carried their hangover into the new season and never looked likely to even get into a position to potentially throw away another title. 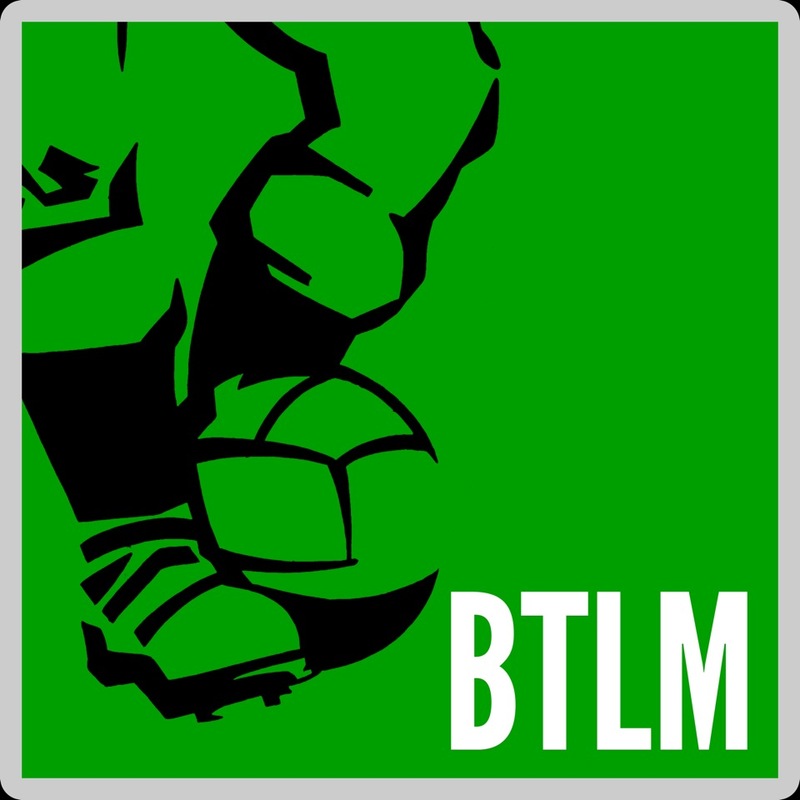 Squandered is one of BTLM’s regular features and you can view all posts in this category here.